Rosslyn landlords are marking the 17th anniversary of the 9/11 terrorist attacks with record participation in this year's Flags Across Rosslyn. 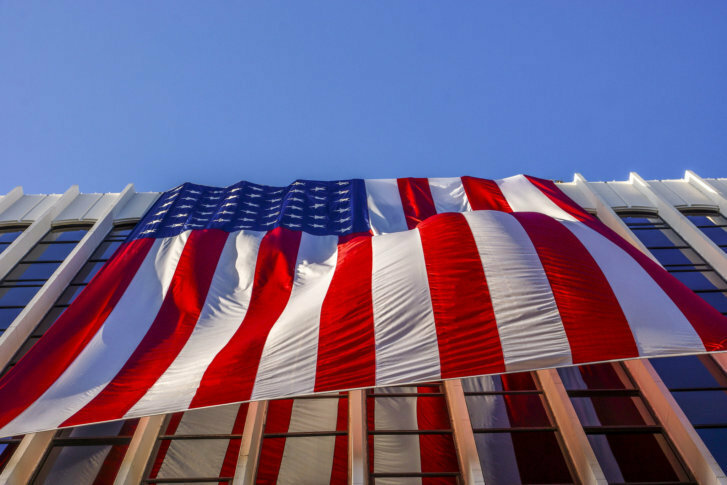 WASHINGTON — Rosslyn landlords are marking the 17th anniversary of the 9/11 terrorist attacks with record participation in this year’s Flags Across Rosslyn, hanging large American flags from the tops of their buildings in a show of patriotism and remembrance. This year, 29 buildings are taking part. Landlords include Monday Properties, Tishman-Speyer, AREP, JBG Smith, Cushman & Wakefield, Brookfield, The Wade Company and Lincoln Property Company. The flags will remain in place through Sept. 14. Flags Across Rosslyn started spontaneously after the 2001 attacks on the Pentagon in Arlington and the World Trade Center buildings in New York City. The Rosslyn Business Improvement District now helps coordinate with landlords a few days before the flags go up. The flags can be viewed throughout Rosslyn, but one of the best viewing perches is from the Iwo Jima Memorial.